Sniper Elite V2 was a game that cast you as a cold, calculating psychopath let loose in a slightly too narrow World War 2 playground, and tasked with vindictively bringing pain, suffering and occasional corridor-based bullet spam. 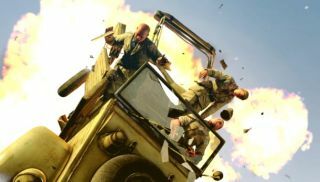 This first Sniper Elite 3 trailer would suggest a much more open sandbox, but the same level of soldier trolling dickery. Only this time, the gross, over-the-top kill-cam reacts to the less fleshy innards of vehicles as well. "Featuring a greater focus on sandbox style gameplay, set in the exotic yet deadly terrain of North Africa during World War Two, Sniper Elite 3 sees American OSS agent Karl Fairburne deep behind Nazi lines, providing crucial sharpshooter skills as the Allies battle Germany's fearsome Tiger Tanks." Naturally, things escalate from there. Although, as yet, there's no confirmation of whether you'll need to stop a top-secret Nazi experiment to create a mecha-hippo. Sniper Elite 3 is due out next year. Later this year, Rebellion are planning a sequel to the Nazi Zombie Army spin-off.